The country's second city, Cebu City boasts a number of interesting colonial buildings, thriving commercial areas, and historic temples. Kick off your visit on the 14th (Fri): take in the spiritual surroundings of Taoist Temple, then steep yourself in history at Fort San Pedro, then contemplate the long history of Magellan's Cross, and finally see the interesting displays at Basilica del Santo Nino. For ratings, reviews, where to stay, and more tourist information, read our Cebu City trip itinerary planner . Boracay to Cebu City is an approximately 2.5-hour combination of ferry and flight. You can also do a combination of ferry, bus, and flight; or do a combination of ferry and bus. When traveling from Boracay in December, plan for a bit warmer days in Cebu City, with highs around 36°C, while nights are about the same with lows around 29°C. Finish your sightseeing early on the 14th (Fri) so you can travel to Puerto Princesa. 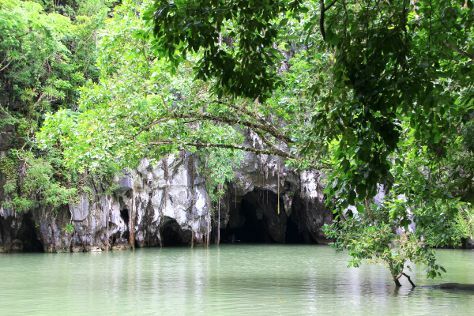 Start off your visit on the 15th (Sat): explore the striking landscape of Puerto Princesa Underground River. Get ready for a full day of sightseeing on the 16th (Sun): take your sightseeing to a higher altitude at Mount Thumbpeak and then contemplate the waterfront views at Honda Bay. For more things to do, reviews, maps, and more tourist information, go to the Puerto Princesa trip itinerary planner . Do a combination of flight and taxi from Cebu City to Puerto Princesa in 2.5 hours. In December in Puerto Princesa, expect temperatures between 36°C during the day and 29°C at night. Finish your sightseeing early on the 16th (Sun) to allow enough time to drive to El Nido. On the 17th (Mon), see some colorful creatures with a scuba or snorkeling tour. Get ready for a full day of sightseeing on the next day: enjoy the sand and surf at Nacpan Beach and then explore the activities along Small Lagoon. To see traveler tips, photos, other places to visit, and other tourist information, use the El Nido trip itinerary website . Traveling by car from Puerto Princesa to El Nido takes 5.5 hours. Alternatively, you can take a bus. Wrap up your sightseeing on the 18th (Tue) early enough to travel to Coron. On the 19th (Wed), take in the awesome beauty at Mt Tapyas, then contemplate the waterfront views at Kayangan Lake, and then explore the activities along Twin Lagoon. On the next day, see some colorful creatures with a scuba or snorkeling tour. To see photos, maps, more things to do, and more tourist information, use the Coron online road trip planner . Traveling by combination of flight and taxi from El Nido to Coron takes 1.5 hours. Finish up your sightseeing early on the 20th (Thu) so you can travel back home.